This past Fourth of July, a nationwide coalition of concerned mothers and their supporters joined the fight for food freedom. Mothers across the country who have been struggling with the increase in food-related allergies, autism and other health problems that their children suffer from have united as they have seen their health improve when they remove Genetically Modified Organisms (GMO’s) from their diets. 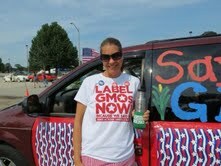 Moms Across America’s March to Label GMO’s formed over 150 groups across the United States who marched in their local Fourth of July Parades. After participating in the March Against Monsanto demonstration on May 25, I learned about Moms Across America, and took it upon myself with the help of others, to organize a group to march in the Champaign County Freedom Celebration Parade. I found support through another concerned mother, Jessica Rasmussen, who helped organize two free showings of the film Genetic Roulette at the Common Ground Food Co-op. This documentary style film highlights the health risks of Genetically Modified Organisms in our food supply, as well as damage to our environment and negative economic impacts for our farmers and our country. I also found support from the Food and Water Watch Group, who helped to spread the word about our march in the parade, and who joined us on the big day with enthusiasm and wonderful signs. Chambana Moms also took notice of our efforts and promoted our march by providing me with the opportunity to respond to a Q and A as the Chambana Mom to Know at www.chambanamoms.com. We decorated my van, and were joined by another concerned mom, Rebecca Butler, who helped make the day fun for the kids by pulling a hay rack with her truck for the kids to ride on. Another local mom who has two children on the autism spectrum, happily donated by purchasing our banner, flyers, buttons and stickers! Our goal is to raise awareness in our community about Genetically Modified Organisms, and we think our march was a success as we saw many conversations sparked along the parade route. We heard shouts of “What’s GMO?” and “Why does it matter?” We were cheered by some and saw others shaking their heads. A few people asked me to stop and explain it to them. We had hundreds of flyers full of information, but were unfortunately not allowed to pass those out, so we passed out organic lollipops with “GMO FREE” signs stuck on them. 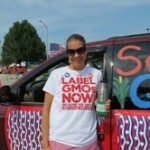 So why did I feel so compelled to participate in the effort to label GMO’s? I am mother to a six-year-old daughter who has food allergies. In this community, we are surrounded by fields of GMO crops, especially corn, and allergies are high. During planting and harvesting season, we have learned that we just have to keep our home closed up with an air filter on high, and we learned this the hard way. This past fall, my daughters’ allergies became so severe that she developed a hacking cough that persisted for months. This resulted in the most frightening night of my life, when she stopped breathing during a tonic seizure that sent us to the emergency room. Thankfully, she recovered quickly, and the air filter by her bed has improved her condition. Was this caused by GMO’s and the heavy use of Roundup? Well, when the sprayers go by in the field across the street from our home, I’m not taking my chances. Shut the windows! The GMO crops primarily used around here are Roundup Ready corn and soy. Roundup Ready crops are genetically modified to withstand heavy spraying of Roundup, so they can survive while all the weeds die. The active ingredient in Roundup is Glyphosate, a chemical which has been linked to the dramatic decline in bee population, as well as to the dramatic increase in autism, digestive issues and food-related allergies. GMO food consumption has even been shown to cause an increase in mammary tumors in rats in one of the first comprehensive independent studies of the effects of GMO’s and glyphosate. GMO’s are banned in 47 countries, and many countries are no longer importing crops from the United States as a result of the continued use of GMO’s in the US. The problems caused by this path we have taken with the biotech industry do not stop there, however. Nature seems to find a way to evolve, and farmers are now contending with ‘superweeds,’ taking them back to square one, only now the weeds are more difficult to deal with and the soil is full of poison. Do we continue to use even more toxic glyphosate, allowing the EPA to raise the ‘safe’ limit again, or stop this insanity? Our first step is to get our lawmakers to require labeling of GMO’s so that we can at least have the freedom to make a choice. GMO’s are not the answer. Listen to your Mother. Jessica Nolen is a Licensed Massage Therapist and Reiki Master Teacher. She works in her home with clients and at Green Yoga Spa in downtown Urbana. She teaches water yoga at Indian Acres Swim Club and volunteers for free Yoga in the Park at Meadowbrook. She is also a mother, and enjoys taking care of her chickens, cats, and working in the garden.